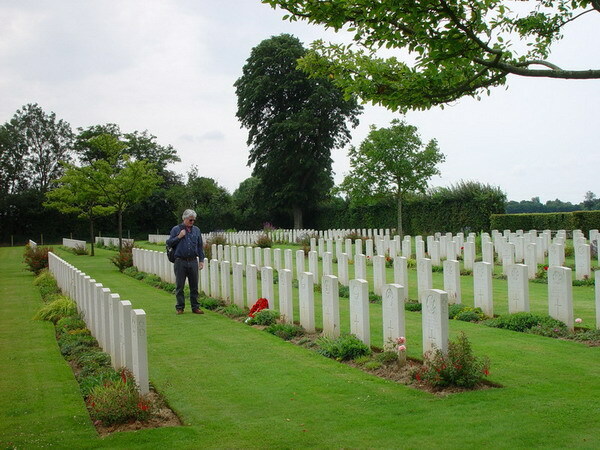 In November 2006 we launched the Remembrance Day Competition. IvorJ was one of three winners. 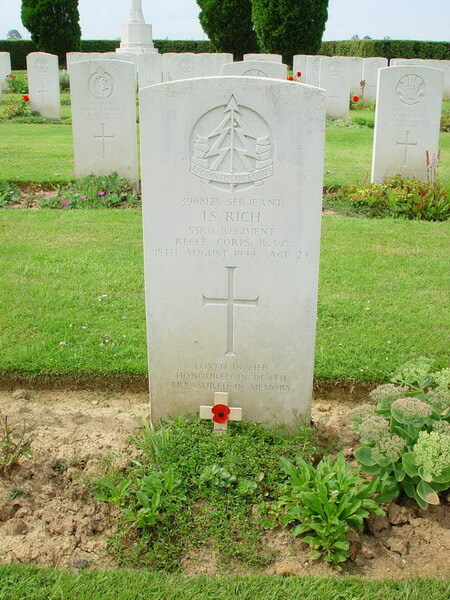 He wanted a a wreath to be placed on the grave of his relative, Sergeant Ivor Stanley Rich, who was killed in Normandy on the 18th August 1944 - a few weeks after D-Day. "I am overcome with the result of your trip to France. 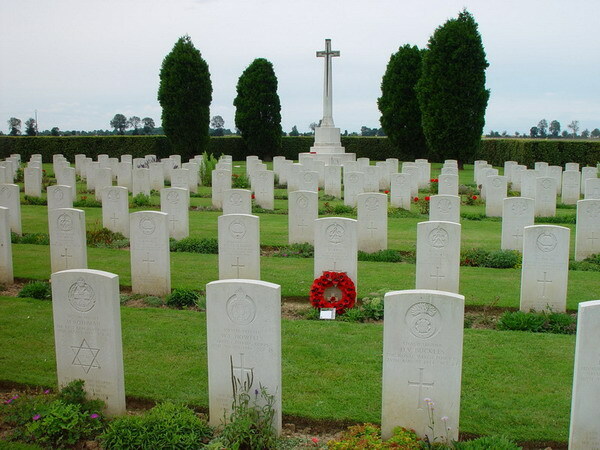 It certainly tears at the heart strings to see how those many fine men are remembered in the fields of France. Ivor Stanley Rich came from South Wales which is part of my heritage and I recall as a child being told about him and in fact was named after him. My middle name was John though which was my Father's name. This was all a memory from long ago and you have my utmost gratitude for what you have done and I will cherish these photographs. 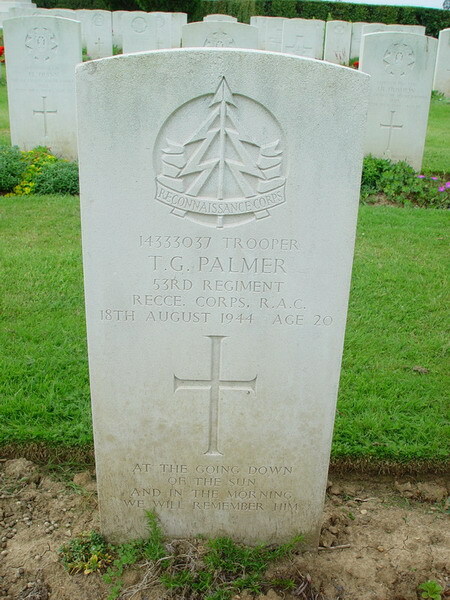 I might add it felt a little eerie to see my name on a tombstone but also feeling of pride to be associated with such men. 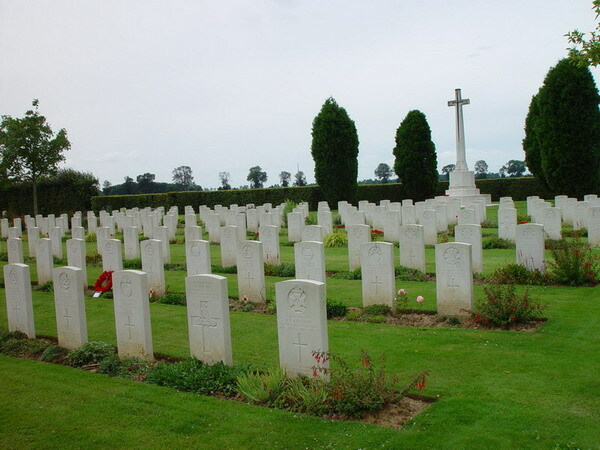 I'm sure they would wonder why they made such sacrifices if they could see the state of the country today. Once again many, many thanks." Here are some more of the images from that memorable trip. 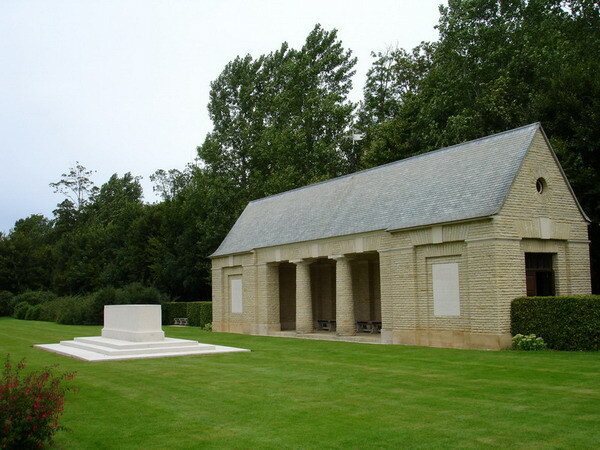 The Commonwealth War Graves Commission Entry. 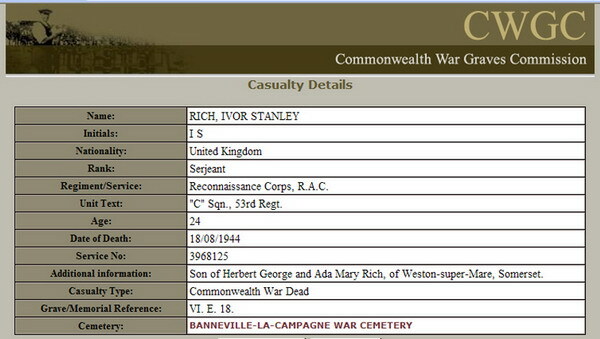 It records the death of Sergeant Ivor Stanley Rich - he was just 24 years old. 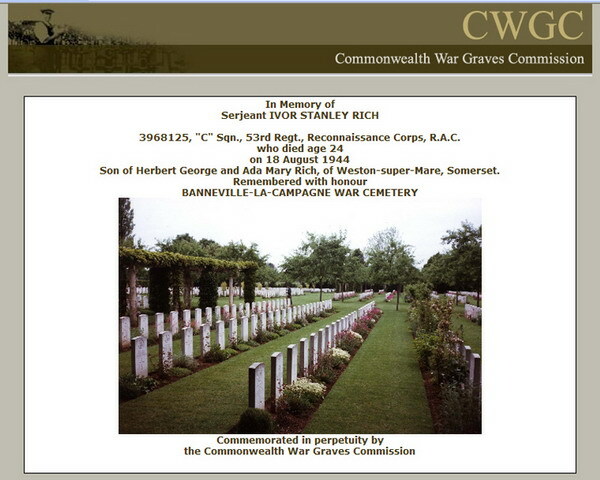 The Commonwealth War Graves Commission Dedication. 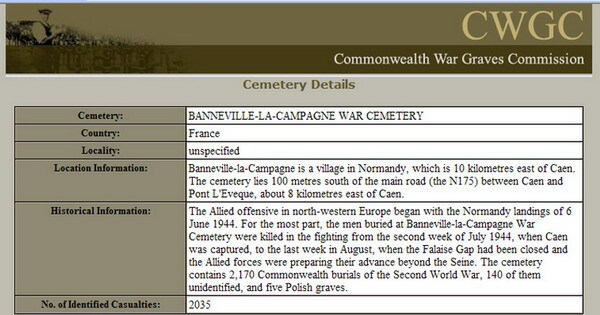 Some details about the British War Cemetery at Banneville-La-Campagne. The directions are not quite right (see below). It is situated on the south side of the D675 just before the boundary sign for Sannerville as you head out of the village, west towards Rouen. 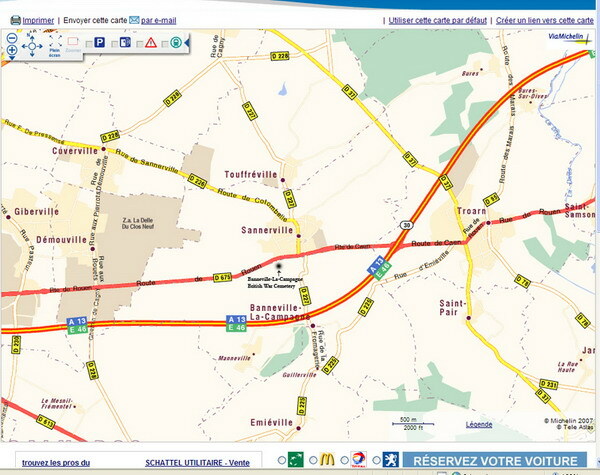 It	is easy to find so long as you do not go to Banneville! But the local people from whom we asked directions were very helpful and were pleased to hear where we were going. 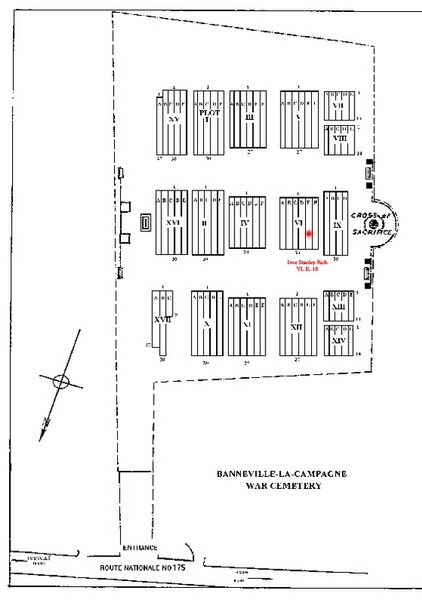 The CWGC Plan of Banneville-La-Campagne Cemetery. 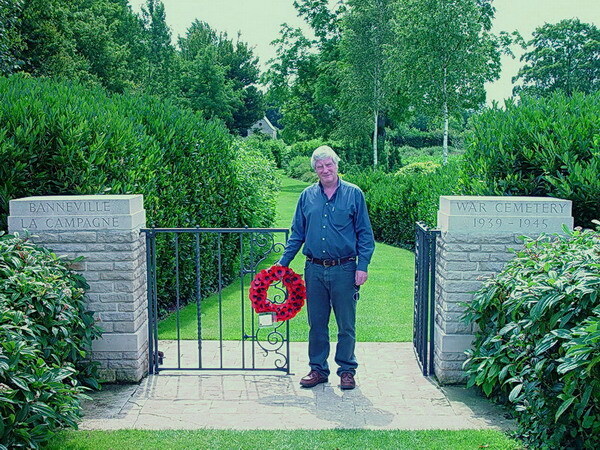 Our envoy with the Wreath at the Cemetery entrance. It was a blisteringly hot, and very bright, day. 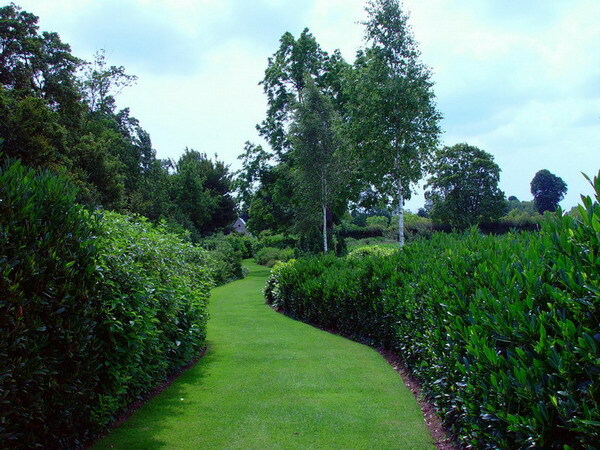 The beautifully maintained path that meanders through about 100 yards of shrubs and trees. The building in the distance holds the Cemetery records - a Cemetery which must rate as one of the most serene I have ever visited. 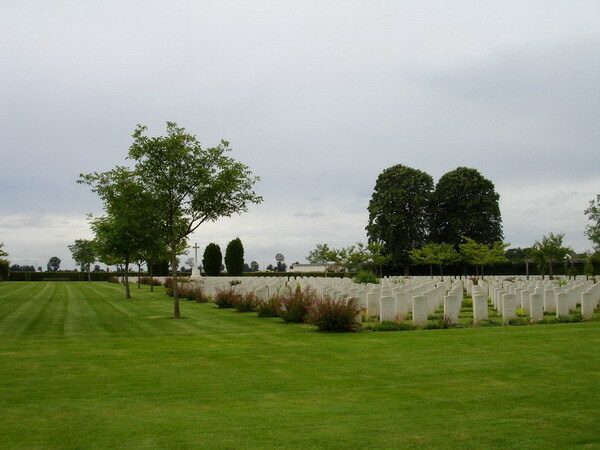 A first view of the Cemetery. It is large and, as the entrance hinted, it is beautifully maintained. The lawns are immaculate. 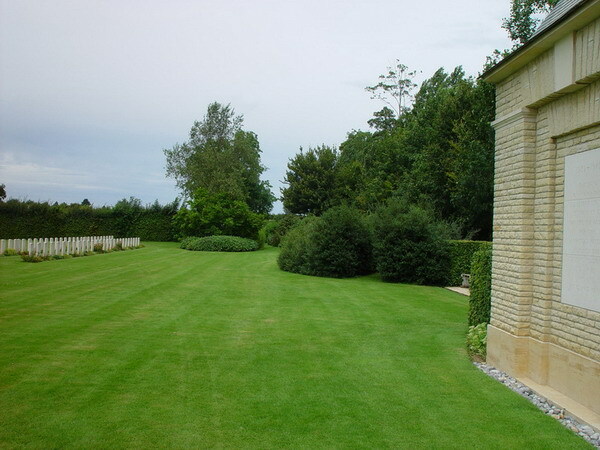 The Stone of Remembrance - It's top surface curved in line with the distant horizon ... without end. 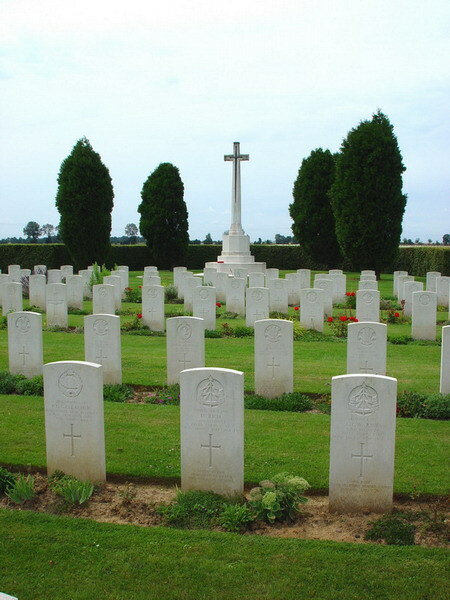 Another view of the Cemetery. 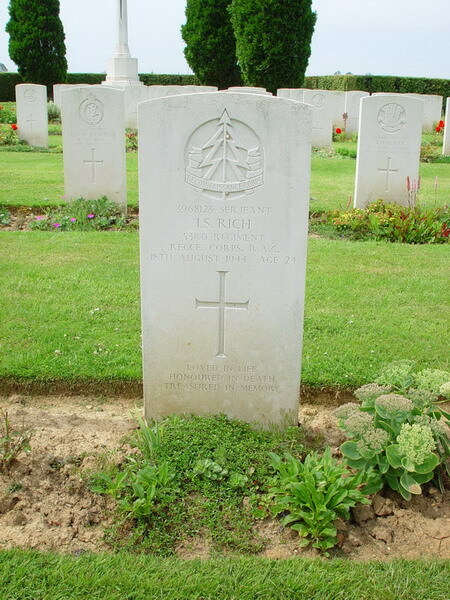 We find Ivor Stanley Rich (front row, centre). 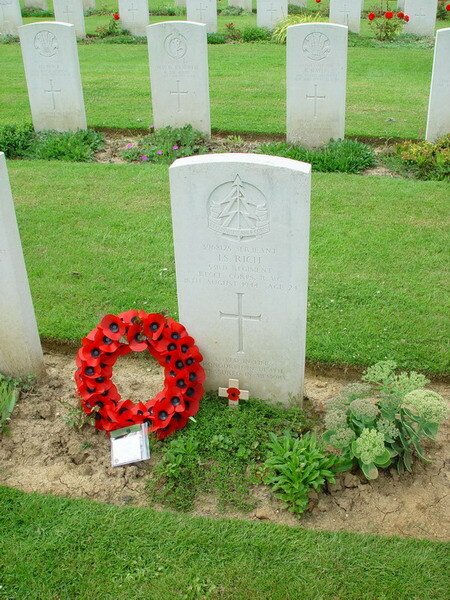 We first placed a Poppy Cross on Ivor's grave. 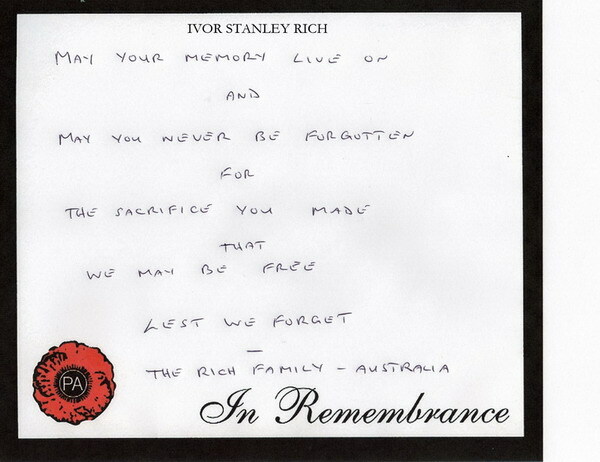 The card sent from Ivor Rich and his family in Australia. The card was sealed in a weatherproof, transparent, holder. 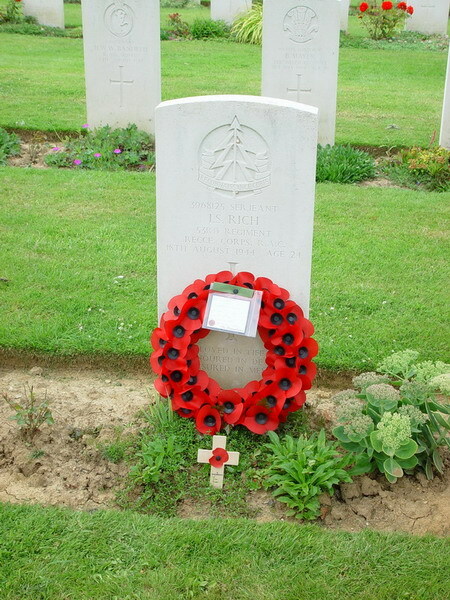 The wreath is placed beside the grave. Another view (the occasional use of sunglasses was 'obligatory' because of the afternoon brightness). 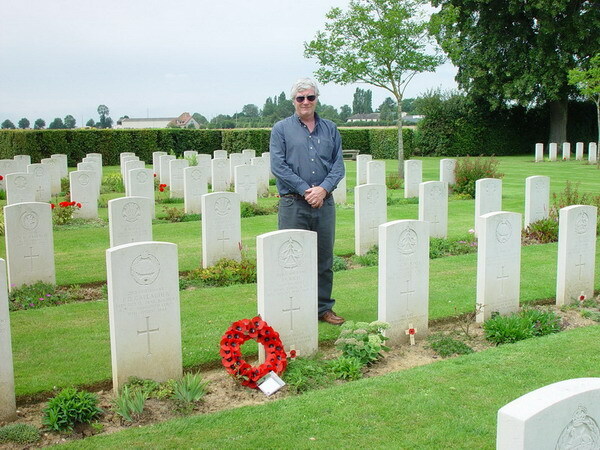 We found three other men from Ivor's unit, all killed on the same day. 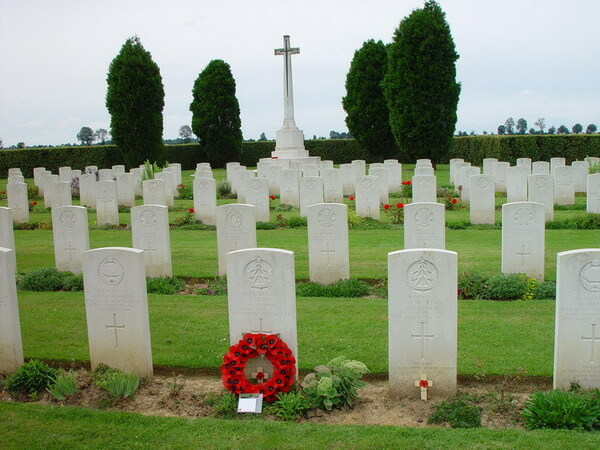 We placed a Poppy Cross on each. Two are shown here. 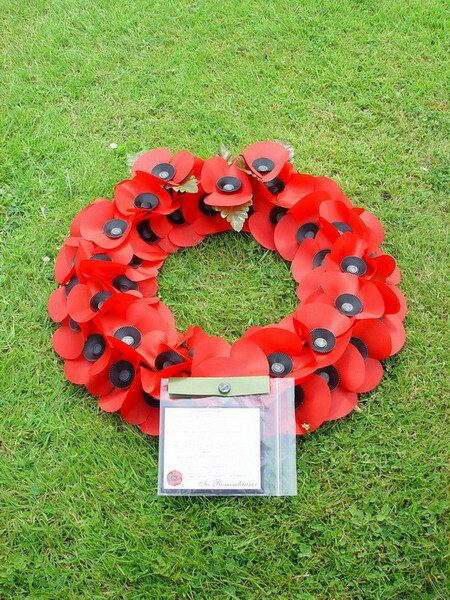 The wreath was 'anchored' before we left so that it would not blow away. 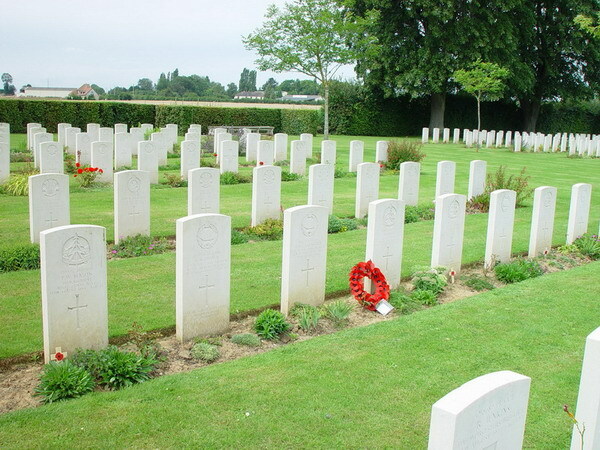 A view showing all four graves from Ivor's unit marked by Poppy Crosses - all killed in action on the same day, the 18th August 1944. 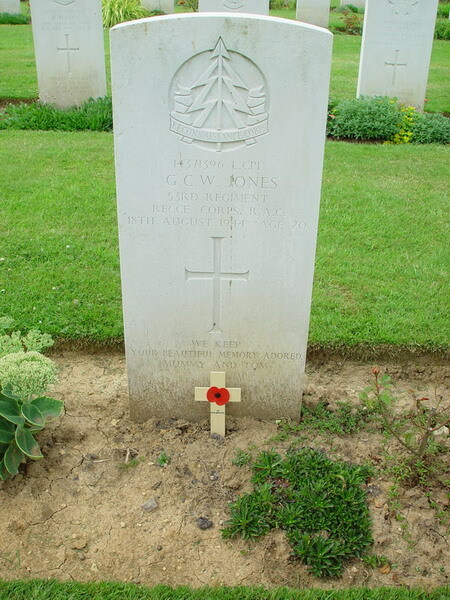 There were many headstones with Welsh connections. 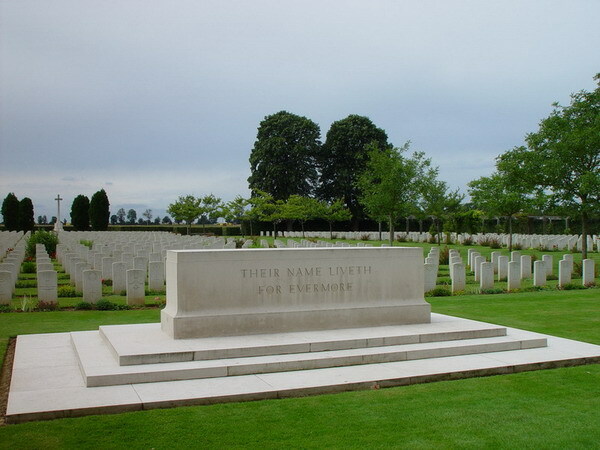 Ivor's Regiment was part of the 53rd (Welsh) Division. 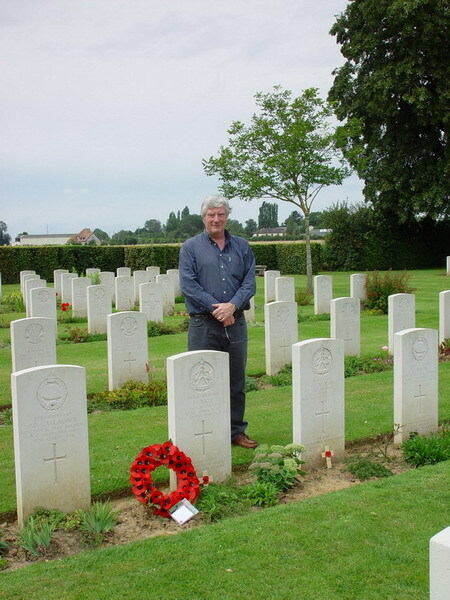 The Division won a VC just two days before Ivor was killed (Major T. Watkins, 1/5 Bn Welch Regiment). "We keep your beautiful memory adored. We will remember him ." 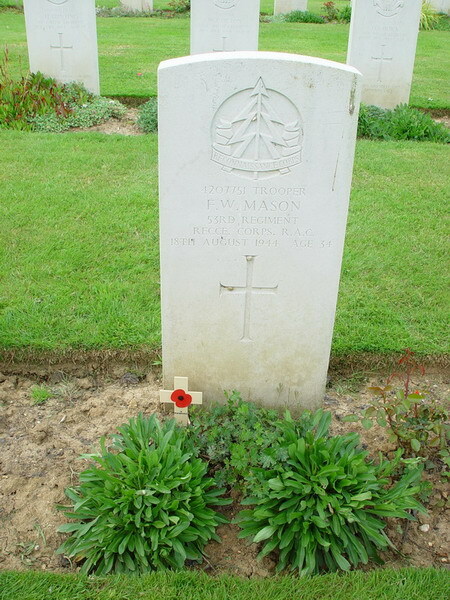 No inscription, but Frederick William Mason is remembered and now has a Poppy Cross. 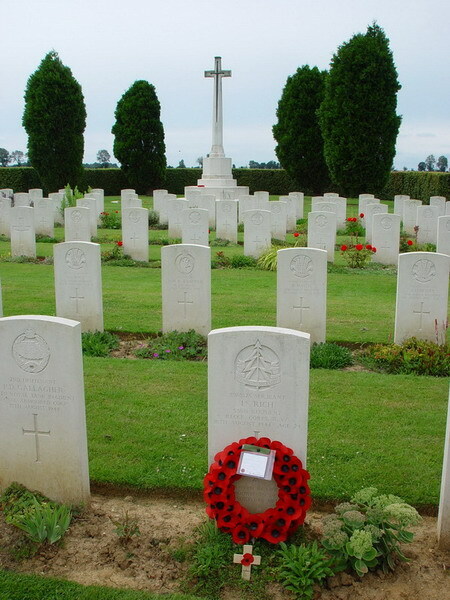 The Poppy Crosses and Wreath will be replaced each time we visit Normandy (which we do regularly when we visit Barry's Uncle/Godfather who is buried in Bayeux, KIA 14th June 1944). A few thoughts and a last farewell ... until the next visit. So an "Adieu" ... and an "Au Revoir". We shall never forget the all-pervading sense of peace and serenity. 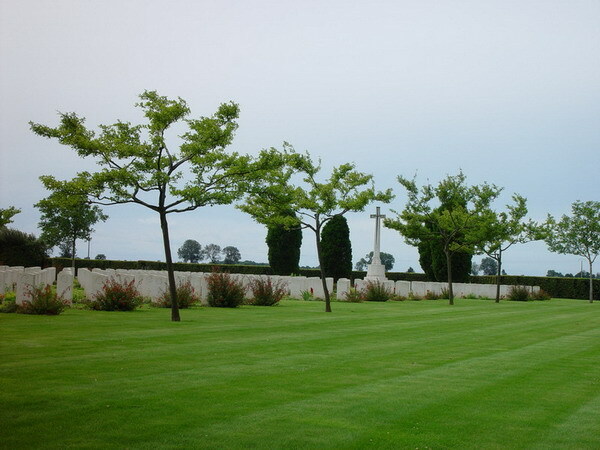 A view of the Cemetery as we left. 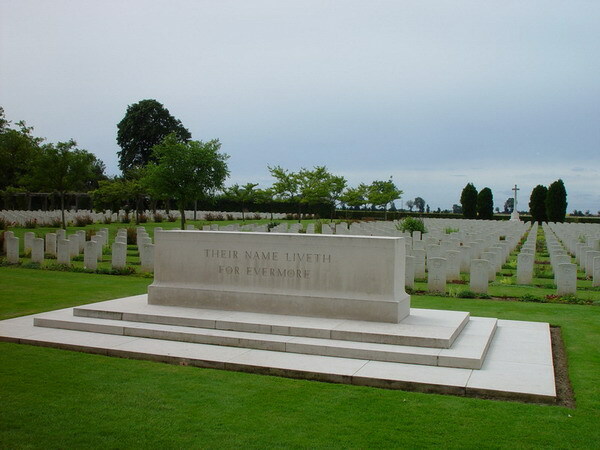 We could still see Ivor's grave as we left. 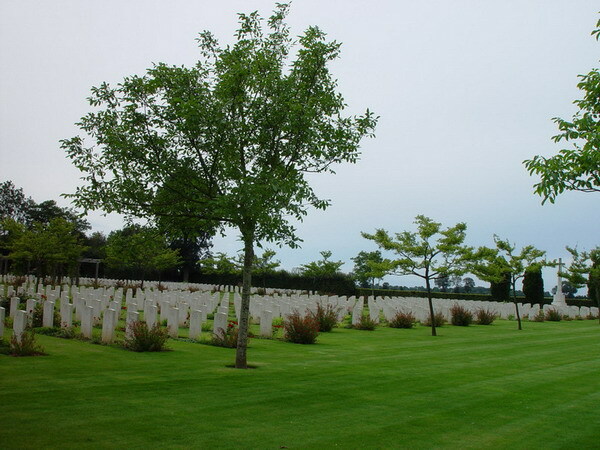 The 'red' of the wreath to the left of the second in the line of trees. A haven of peace - and a place to sit and reflect. 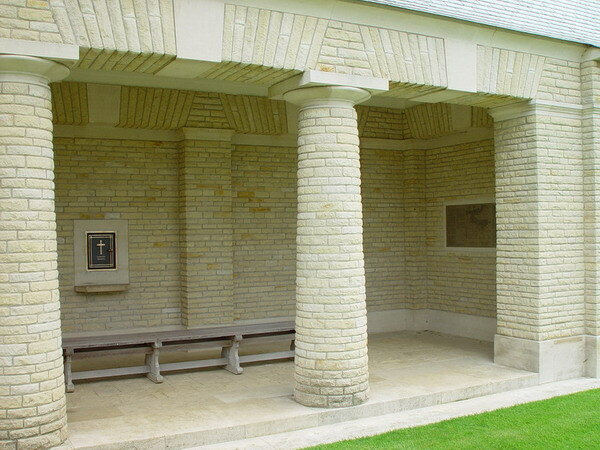 The receptacle on the wall that holds the Cemetery Register and Visitors' Book. 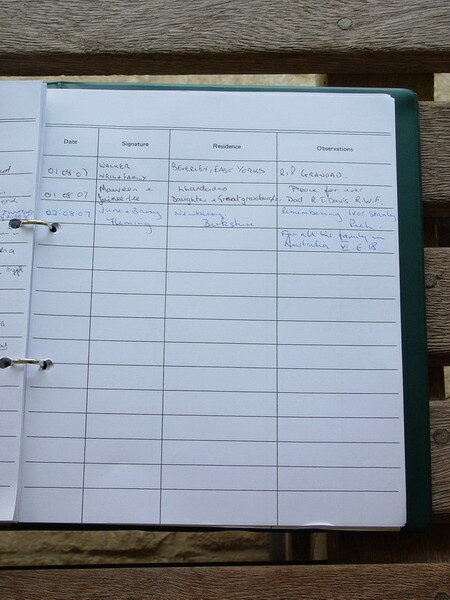 We signed the Visitors' Book. 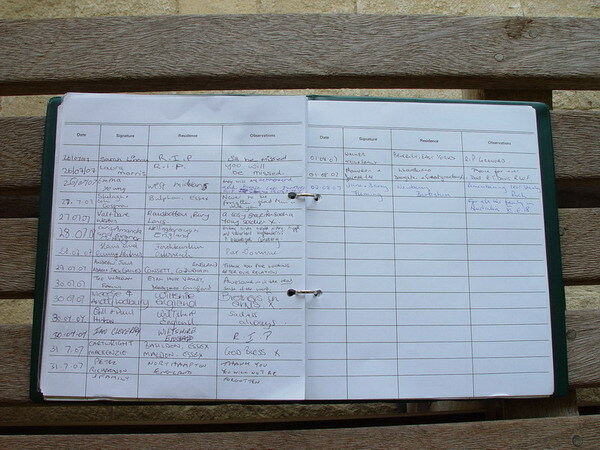 Note the daily visits made to this Cemetery. For all his family in Australia. VI. E. 18." 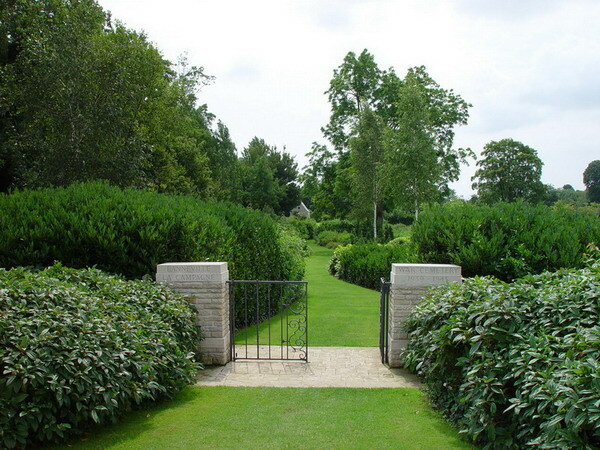 The path that leads to the gate. 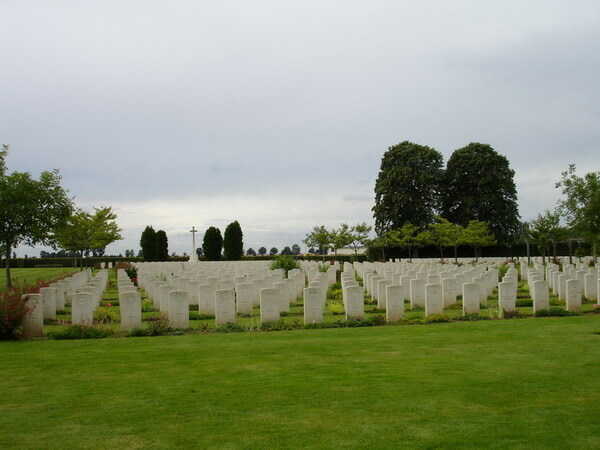 As we headed towards it, it was uppermost in our minds that more than 2,000 men would remain behind "In Perpetuity" so that we could walk - free. ... but we shall never forget. That is our pledge.